Wuzzle came to us via an amazing young woman who spotted his story in her local newspaper and she was determined to save him. 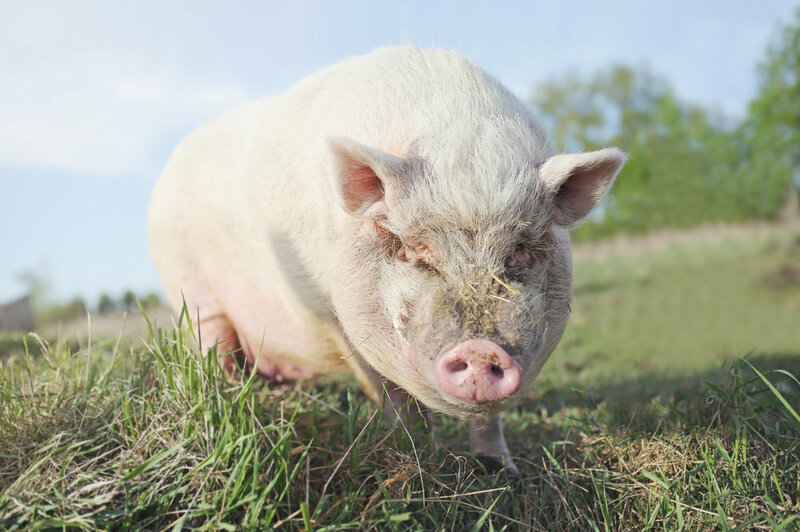 A fraternity had purchased him to fatten up for a pig roast. The housing they provided for him was sub-standard to say the least, and Wuzzle escaped, finding himself at the local animal shelter. He was given back to the fraternity, but not before his story made it into the papers. Clare went knocking on doors until she found him and managed to secure his freedom and brought him to us. He was so small and we all assumed he was a potbelly, but he grew and grew and grew. It became clear that he must be a potbelly/farm pig mix and now tips the scales at about 600 pounds. His rescuer named him Russell, but that slowly morphed into Wuzzle. We're grateful to her for saving his life and continuing to be in his life, all these years later.